Her jewelry, when she wears it, is also minimalistic. This is a shift from our previous features (Annalise Keating and Mary Crawley), who both wear chunkier, more elaborate pieces. 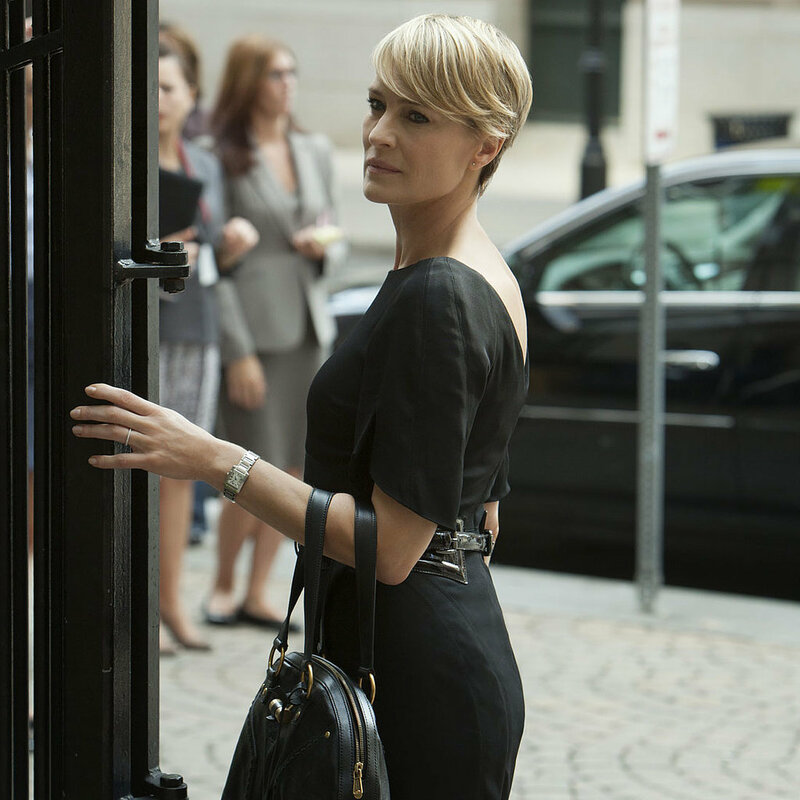 With Claire Underwood everything is understated. Even her wedding ring is thin and subtle. Here, Claire’s only jewelry accessories are her silver wedding band with a matching watch and pair of earrings. The nice thing about simple jewelry is that it’s fairly simple to make. For instance, you can recreate multiple variations on Claire’s earrings in just a few steps. Just get a pair of flat-pad earposts and some Duco cement. Then glue any embellishment you want to the flat pad. For the look pictured above, you can use cube Swarovski crystals or some sparkling rondels in silver or gold. Other Claire-inspired options include pearls, pyrite, onyx, and hematite. Once you glue your bead to the flat pad, allow the glue to dry overnight. Then wear your Claire Underwood creations with earnuts to make sure you don’t lose them! If you want to go with one of Claire’s dressier looks, a classic pearl necklace is the way to go. For a traditional knotted pearl necklace, you’ll want to work with silk. Pre-stretch it using the instructions provided here, then simply tie an overhand knot between each bead and finish off with bead tips. If you’d rather work with beading wire, you can stick with just pearls or jazz up the necklace with spacer beads. Beaders and readers, please remember: making beautiful Claire Underwood-inspired jewelry does not give you the right to take down the president with your evil husband or threaten a pregnant activist. But please do share your #BeadazzledCreations — and comment below with your predictions for season three! Our “What We’re Watching / What We’re Wearing” series draws from all media to feature distinctive jewelry anyone can make themselves. If you would like to see us feature any particular character or public figure, comment with suggestions! Images from this post come from various Google Image results.